The Washington Nationals’ Triple A team, the Rochester Chiefs, come to Durham today start a three-game series, the last the teams will play each other this year. 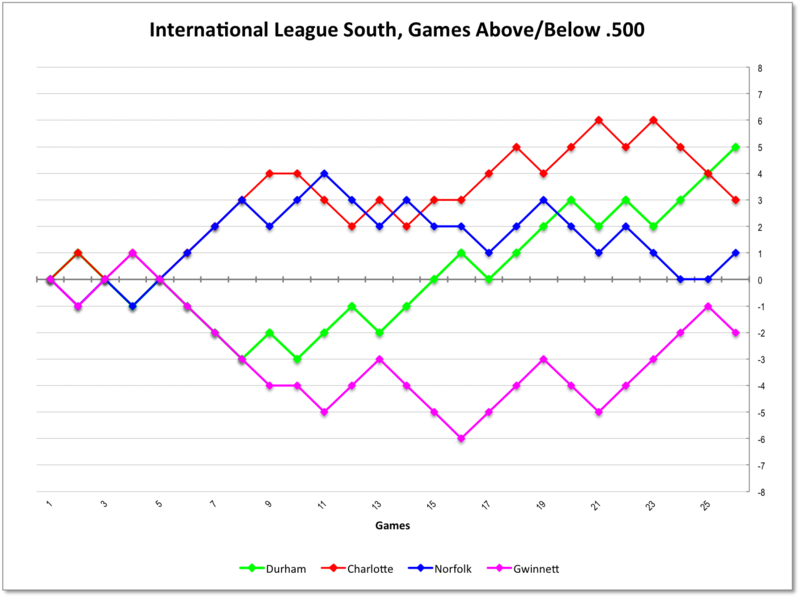 The Chiefs are coming off a pretty awful run that saw them losing 12 of their last 13 games, including a 4 game sweep over in Norfolk earlier this week. The Bulls and Chiefs played a three game series up in Syracuse earlier this month and won two out of three. In the matchup, there’s been some change over the month, much of it not favoring the Bulls. 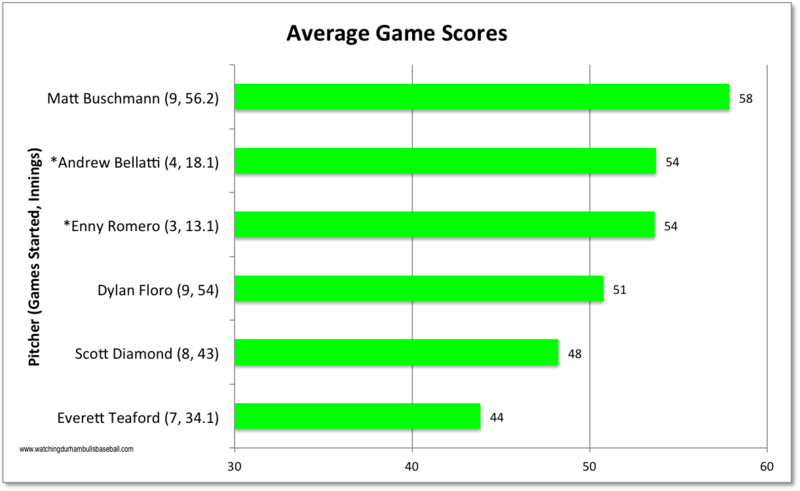 The Chiefs stayed last in batting average; the Bulls dropped from 7th to 11th. The Chiefs also stayed 13th in the IL for OPS; the Bulls dropped from 3rd to 8th. The Chiefs were at #8 in ERA and dropped to #9; the Bulls dropped from #2 to #7. The Chiefs have seen even more turmoil than the Bulls, as hard as that is to imagine. They have had 25 different players come to bat this year, but “only” 20 different pitchers. The Bulls have just 19 different ballplayers come to bat, but lead the Chiefs with 22 different pitchers. The Chiefs’ parent team is breaking out of a slump. The Chief’s look to break out of theirs. We’ve been putting up a lot of stats lately that seem to back up the idea that starting pitching is important. This game was a good example because veteran (31) Everett Teaford never quite got a handle on the game. The 4th inning was particularly painful because he had two outs and none on base before things fell apart. Four doubles, a single, and a walk later he finally got the last out with two runners on base. Four runs had scored. The game was then pretty much out of reach given that the Red Wings starter was cruising. Note: The two runs in the 1st inning were scored after two outs had been recorded. The Bulls did pull off a couple of double plays yesterday and, as was pointed out on twitter, the combination of Querecuto-Reginatto-Arencibia has a melodic turn. The 4-4-5 beat fits nicely into a song. Otherwise, all the new guys didn’t do any better than the old guys and the rehabbers. Ryan Brett was back and did get a double and a walk at DH. Rehabbing C.J. Riefenhauser pitched an inning and gave up two hits, but no runs. Richie Shaffer came down from the clouds with a 0 for 3 day. Juniel Querecuto was 1 for 3. About the only hitter who had a good day was J.P. Arencibia who went 3 for 4 with an RBI. The Bulls’ 5-game winning streak came to an end. They get a well-deserved day off today. Hope the weather stays nice. We could hope that the roster will stabilize, but there’s too many players on the disabled list here and with the Rays for that to happen. Eventually, you have to think folks are going to get healthy and stay healthy. Until that happens we can expect the constant shifting and changing of this team to continue. For example, yesterday it was announced that pitchers Enny Romero and Preston Guilmet are coming back from the Rays. This is a traditional stat, ERA-Earned Run Average, shown in a non-traditional way — as it changes over time, in this case over the last 15 games. 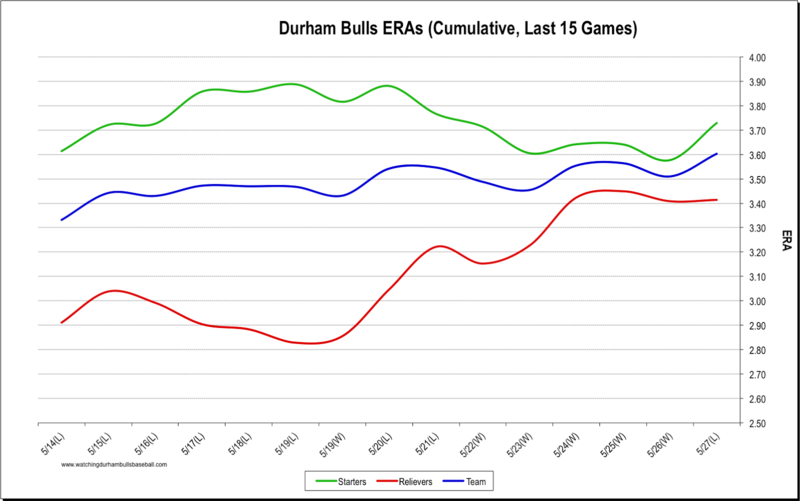 Remember that less is more when it comes to ERA and the drift upwards shown in the team ERA is not a good thing. 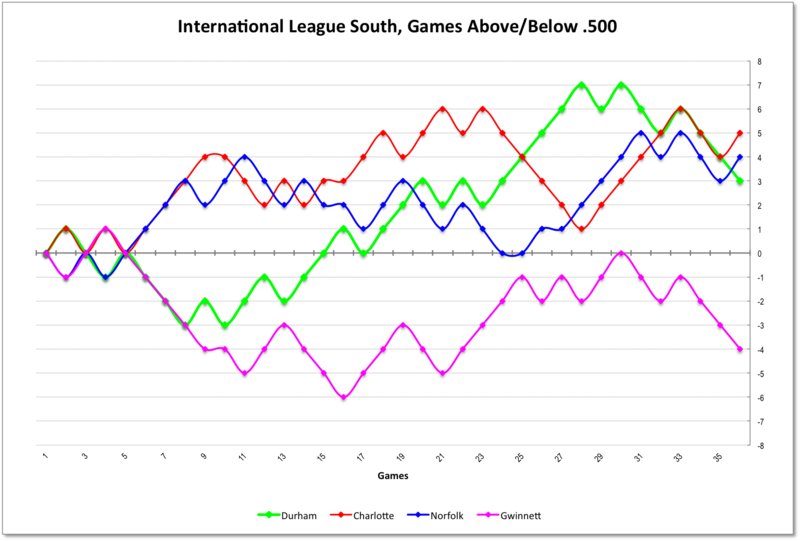 Today’s 3.60 puts the Bulls 7th in the 14-team International League. 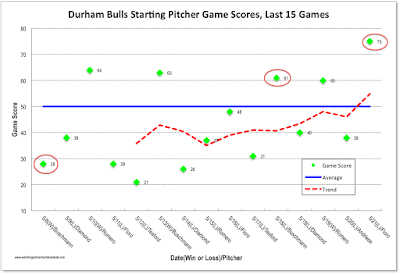 The Bulls lost 9 of these 15 games and obviously the pitching was a big piece of it. 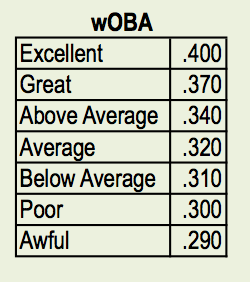 However, that’s a nice little downward trend in the starting pitcher ERA (not counting yesterday, of course). 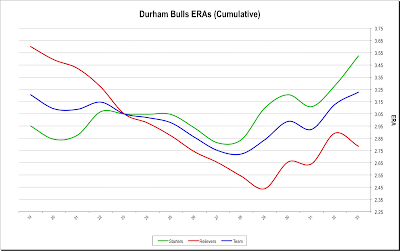 Overall, the reliever trend is very worrisome, especially as it was trending upwards even as the Bulls were winning. But, remember that it’s mostly relievers who have been spending all that time in the RDU and Tampa airports this month. Dylan Floro had a solid outing, scattering Red Wings' hits around, and Cory Brown hit the Bull. First time this year. I couldn’t make the game, and I regret it. Looks like it was fun to watch. Two ballplayers who started the year with the Bulls are back — Ryan Brett and C.J. Riefenhauser. Both of them were called up to the Rays in April, broke something while there, and went on the disabled list. If I understand the rules, they are officially here on a rehabilitation assignment and don’t count against the Bulls roster, but they are on the 40-man roster of the Rays and once they finish their rehab something will have to happen. There’s a good chance that they will stay here. Meanwhile, they will give the Bulls' bench a small break. However, each comes with a little tag attached to them that tells the manager what the player can, and cannot, do. Possibly a pitch count for Riefenhauser, but Brett played a full game yesterday, so maybe he’s ready to go. The clock would be ticking for Mr. Querecuto, making him a leading candidate for this year’s Moonlight Graham award. A couple of sources are reporting [MLB Trade Rumors, Rays Index] that Grant Balfour has opted out of his contract with the Rays. Too bad. We liked watching him even if he looked dissatisfied with himself most of his time here. He kept checking the pitch speed clock and never seemed to be that into the game. On the other hand, he put up some decent, but not great, numbers in his 8 appearances as a Bull. Good luck. Maybe he will catch on with another club. When the Bulls took the field last night not one of the players on the infield started the season with the Bulls. Not one. We won’t count catcher Luke Maile. Starting pitcher Matt Andriese has only had three appearances with the Bulls. First Baseman J.P. Arencibia’s first game was in mid-April. 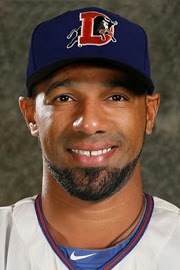 At second base was Leonardo Reginatto who began the season with the Montgomery Biscuits and played his first game for the Bulls on April 23, but he has gone back to Montgomery once along the way. At shortstop was Juniel Querecuto, who was called up from the Single A Charlotte Stone Crabs just yesterday. And at third base was Richie Shaffer who was called up from the Montgomery Biscuits on Sunday. This, of course, reflects the chaos down in St. Petersburg, but the Bulls have a few of their own homegrown problems. On the DL and leaning against the dugout railing last night were, as reported in the Bulls Game Notes, Hak-Ju Lee (left hand laceration), Vince Belnome (shoulder), and not seen, but on the list, Alexi Casilla (hamstring). Meanwhile on the field the Red Wings’ Jason Wheeler went 5 innings allowing only one baserunner, Luke Maile. But the 6th didn’t go so well. Maile led off with a single. New guy Juniel Querecuto hit a double; Taylor Motter singled those two home. Leonardo Reginatto singled. Eugenio Velez singled. Curt Casali doubled home 2 runs. That was then end of Wheeler’s night. But after a K and an intentional walk of Corey Brown, the other new guy, Richie Shaffer, hit a sacrifice fly to bring in the last run. By the way, after his extraordinary start where he had a slash line on his first appearance of 800/.800/2.200 (Batting Average/On-Base Percentage/Slugging) to go with 3 RBI; Richie Shaffer’s numbers have plummeted to: .571/.500/1.571 with 4 RBI on 7 at bats. Still not too bad. As mentioned, there’s chaos down in Tampa Bay. Tim Beckham got turned around on his way to Durham and started at shortstop for the Rays last night. He went 1 for 3 in their loss to the Seattle Mariners. Jake Elmore was called up from the Bulls, started in left field, and was 2 or 2 with a walk. By the way, note who is playing center field for the Seattle Mariners: Long time Durham Bull, and member of the All-DBAP team, Justin Ruggiano. I had lost track of him. The really important news is that the Bull Durham Beer Company is brewing and serving. I am far from expert on the subject of beer, but I tried the Lollygagger Kolsch and liked it. Speaking of beer, I commend to you the dedicated research and explication reflected in the "Beers of Coca-Cola Park" by fellow Triple-A blogger KramsKorner up Lehigh Valley way. If there's someone out there who'd like to take on the challenge of doing something like this for the DBAP, please let me know. But the bar has been set pretty high, I'd say. 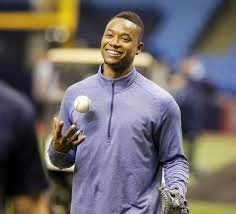 Infielder Tim Beckham is coming to the Durham Bulls after a solid start with the Tampa Bay Rays this year — 33 games, decent stats. 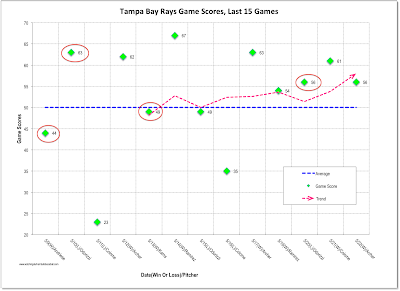 Commentary implies that in the short run the Rays need a pitcher more than they need an infielder. They called up Enny Romero, who has been doing an above-average job for Bulls. 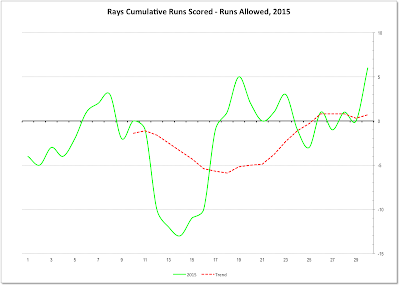 Mr. Beckham is showing some real pop this year, as discussed over on Rays Index. Here’s hoping he brings that to the DBAP. The Bulls “power hitters” this year are still looking for a charging station. After a long rehab, Beckham only got in 15 games with the Bulls last year and our guess was that 2015 might be his year. We've watched him a lot over the years and his arrival certainly helps fill the hole that Hak-Ju Lee's injury has left, plus he is certainly a much better hitter. This could be a real boost to the Bulls upcoming home stand. Here's hoping being optioned doesn't work on his head. This is our first look at the Durham Bulls hitters this year. It’s a bit early and the sample size is pretty small. But still worth a look, I thought. I used a cut off of 50 plate appearances before sorting the table. The players marked by an asterisk are on the Tampa Bay Rays 40-man roster. The players marked with a strike-thru are players who have been with the Bulls and might be coming back before the year is out. Joey Butler went up to the Rays, Leonardo Reginatto went down to Montgomery. 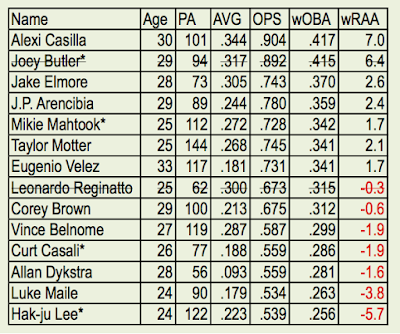 To be honest, I was surprised to see Mr. Casilla come out on the top of the list. I think he’s a terrific second baseman, with a very accurate side-arm snap throw that rarely misses (only one error on the year). But I had not been paying attention to his bat. That could be because I usually undervalue switch hitters. But there he is with 31 hits (5 doubles, 3 home runs), 9 walks, and 14 RBI. At 38 games into the season he is the best of the bunch. What about the players at the other end of the table? Two are catchers and they, mostly, don’t count. But Hak-Ju Lee and Alan Dykstra? Hard to say. Both are serious talents, neither is having a good year (and it’s been a long time since Lee had a good year). Hitting coach Dave Myers needs to help these guys find some answers. 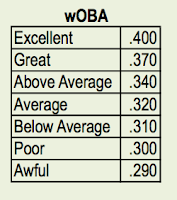 This table is a rough guide to what wOBA numbers mean. OK, I know it was Star Wars night and all, but those were quite possibly the ugliest uniforms I’ve ever seen on baseball players. 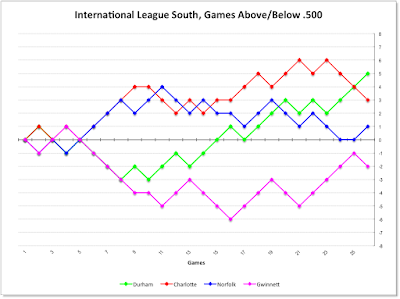 And then the Durham Bulls went from first place to third place in the International League South as this even uglier home stand continues. Dylan Floro looked pretty good through the first four innings, got hit hard in the 5th (2 doubles and a single, one run); and hit harder in the 6th, two singles and a home run. Not sure why Floro gets to stay up into the 90’s in his pitch count while other pitchers are being pulled much earlier. New guy Preston Guilmet, last seen pitching for the Buffalo Bisons but claimed from the Toronto system the other day, had a nice inning, as did Jhan Marinez, but it was too late. 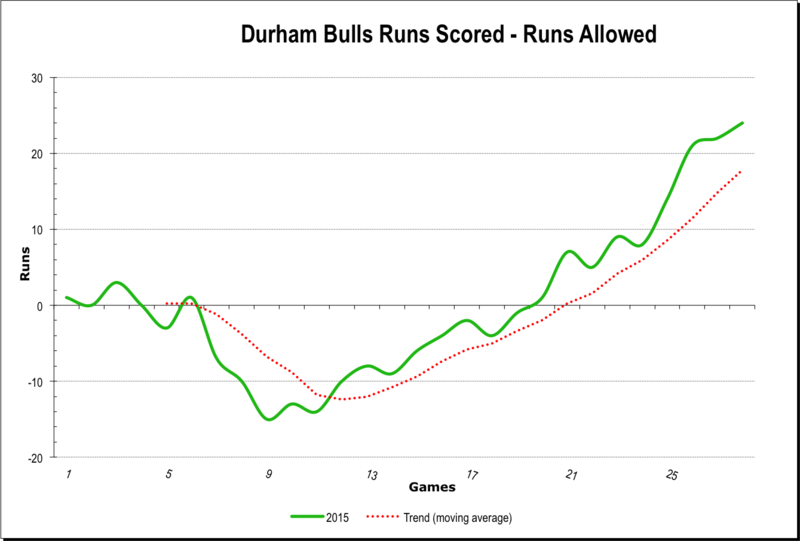 The Bulls haven’t hit the ball well for the last week. In fact, last night all the offensive excitement was over after the first two batters, a single by Taylor Motter and a home run by Nick Franklin. Infielder Leonardo Reginatto has been sent back to Montgomery. We liked watching him play and he was doing a decent job at bat (.300/.323/.350). He’ll probably be back when/if the Rays give up on Hak-Ju Lee. 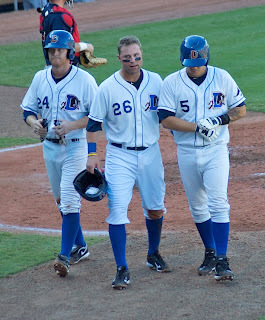 Bryce Stowell was also sent to the Montgomery Biscuits. Too bad, because he had pretty decent numbers. I expect he will be back as well. As mentioned above, the Rays claimed reliever Preston Guilment from the Toronto Blue Jays. Stats. He looked just fine last night. Rehabbing Jake McGee is on his way back to Tampa Bay. Rehabbing Nick Franklin was pulled from the game after his home run last night. So he might be on his way back as well. José Dominguez came of the disabled list and should be in the bullpen for today’s game. According to The Tampa Tribune, Andrew Bellatti is coming back to the Bulls. He did a terrific job as a reliever for the Rays. We’ll have to see if he’s going to be starting or in relief as a Bull. For a couple of days the Tides and the Knights were losing games along with the Bulls. Not yesterday, so that changes the chart to show the Bulls sliding into third place. 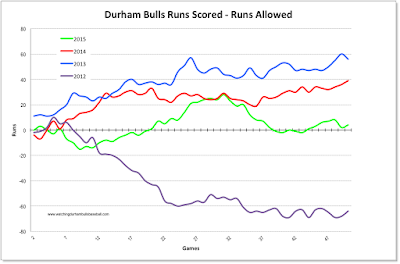 The Bulls were behind the Bisons in virtually every statistical category except for one — runs scored. And that, of course, made all the difference. In their absolute worst offensive game of the season (just two total bases on two singles), the Bulls prevailed when the pitchers and defense (2 double plays) had a shutout. Sharp base running was the difference. With one out in the 6th inning, Taylor Motter stole second after a single. Nick Franklin walked and then they pulled off a double steal with Mikie Mahtook at the plate. Motter scored on a Mahtook ground out. 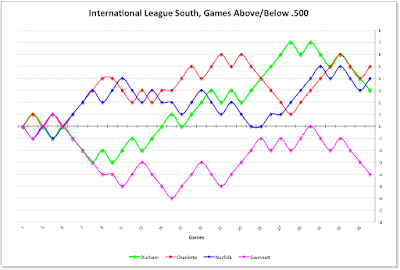 The Bulls come home tied for first place with Charlotte in the IL South (Charlotte has a modest .006 pt lead). The Bulls have a four game set with the Scranton/Wilkes-Barre RailRiders, the Yankees AAA team, who are 5-5 in their last 10. Their parent club is riding high and the statistical difference between the two is not all that great. Should be a good series. The Bulls leave town for Rochester as soon as the series is over. Pitching, in just one awful inning, was enough. Then the Bisons brought on Todd Redmond. This will be the last time the Bulls see him this year. That’s a good thing. Hard to find much to like in this game, so let’s at least mention the solid job that veteran (33) Jim Miller (stats) has been doing for the Bulls. He came in last night and pitched 2+ innings and kept the Bulls within reach. In 11 appearances so far he has pitched 19⅓ innings for an ERA of 2.79 (FIP of 2.68) and a decent WHIP of 1.19. He has not allowed any home runs and not one of the 4 runners he’s inherited has scored. 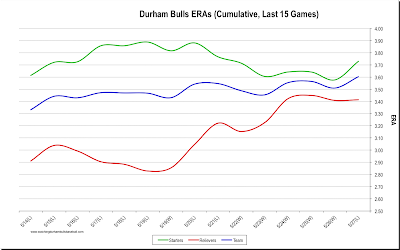 He spent the last two years with the Yankees AAA team, the Scranton/Wilkes-Barre RailRiders, but his numbers so far with the Bulls are much better than those years. Jake Elmore, who had been up with the Rays, was back and playing 3B, 0-7 with on walk so far. Hanging out in St. Petersburg seems to mess with your game — a lot. Back on April 30 when we first looked at this chart things were on nice downward trend. That continued for several days, but recently the starting crew has had its problems. These are the last 15 days of the cumulative ERAs of the starting and relief pitchers. 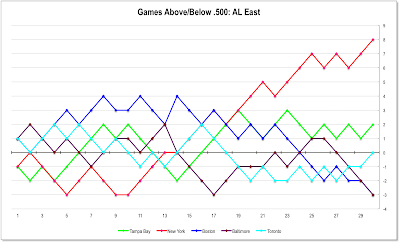 As the season progresses you would expect to see less variability in the ups and downs, but this is a fairly obvious and worrisome trend. 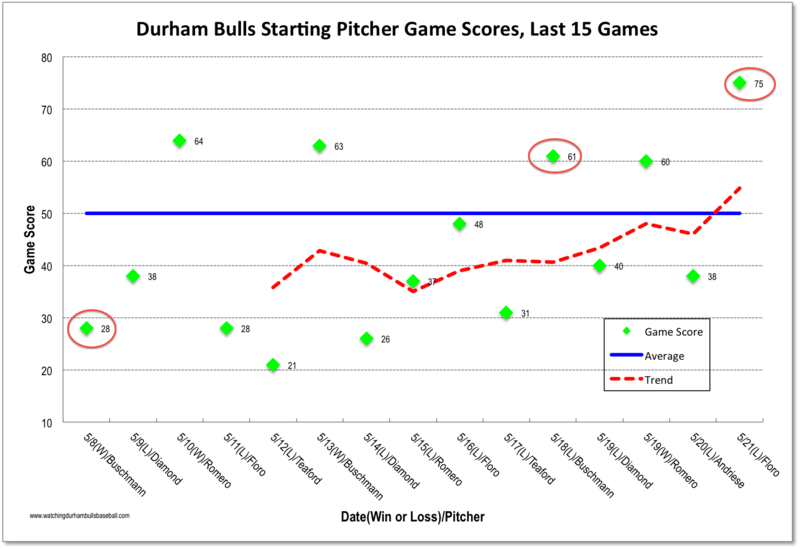 Note that the Bulls have had 21 different pitchers so far this year, ranging from Dylan Floro’s 40 innings to Jose Dominguez’s and Matt Andriese’ 2 each. Five home runs aren’t enough, and an intentional walk plus an unintentional walk lost the game. 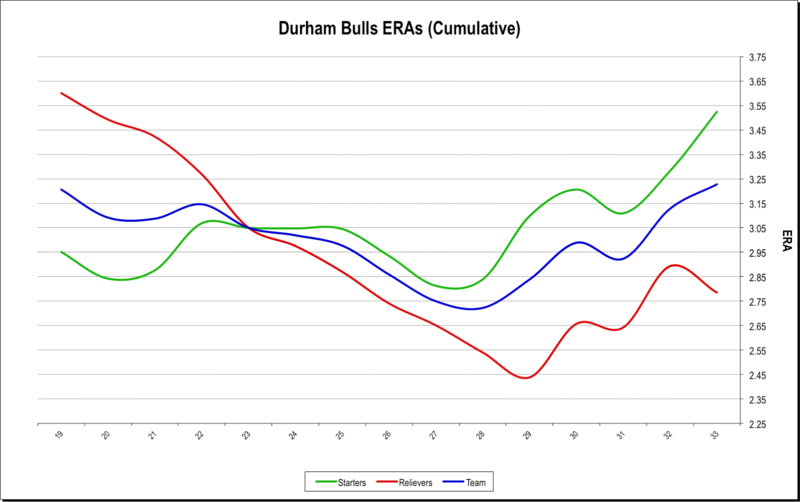 Bulls hitters hit three more home runs (Mahtook, Dykstra, and Arencibia), but this time the pitchers matched them with solid performances. Enny Romero made his 2015 debut with the Bulls after a long getting-ready stretch that goes back to spring training. We were not particular fans of Mr. Romero last year, but he certainly had a solid performance yesterday. How long he sticks with the Bulls is likely to be the subject of intense speculation down St. Petersburg way. Alan Dykstra has built an odd record since joining the Bulls. The 6’5“ switch-hitter has only had 3 hits in his 10 games for a batting average of .088. However, those three hits are a double and 2 home runs plus he’s managed 10 walks (including at least one intentional walk). That leads him to an extraordinary batting average/OPS gap. His OPS is .590. He carried an OPS of .930 with Las Vegas of the PCL last year, with 74 RBI. Yesterday he followed up Saturday’s 2 run shot with a solo one in the 5th inning. We’ve been skeptical of Mr. Dykstra. Could we have been wrong? Overlooked in the offensive stats was how often the defense made a difference yesterday. It was a double play that closed the deal in the Bulls favor on Friday. Yesterday it was three of them that made big differences. The Tampa Bay Times is reporting that Grant Balfour has an end-of-May opt-out to his minor league contract. That certainly means that he won’t be around Durham after this month. The Process Report has a nice profile of Andrew Bellatti written by Adam Sobsey, one of the co-authors of Bull City Summer*. The Bulls rode over to Buffalo yesterday for a rematch with the Bisons tonight. And, yes, it was just a couple of days since the Bulls were playing them at the DBAP. 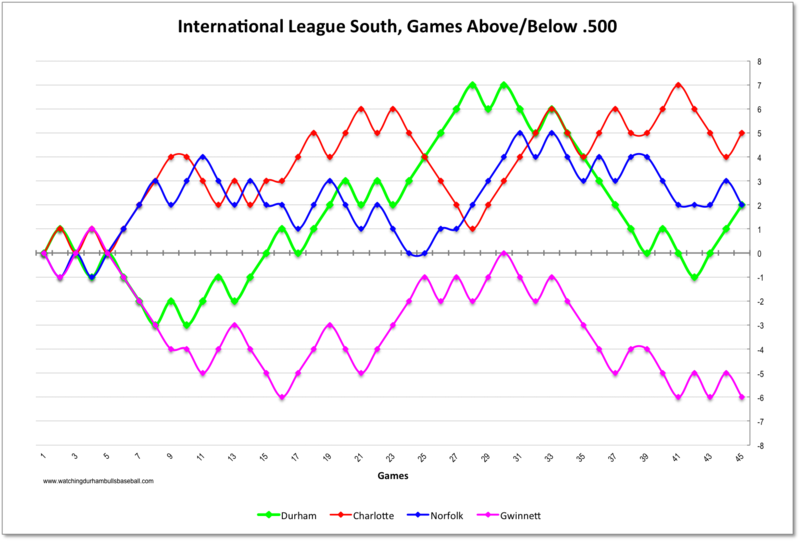 Interesting to see what’s happened to their numbers since we last looked prior to that series. 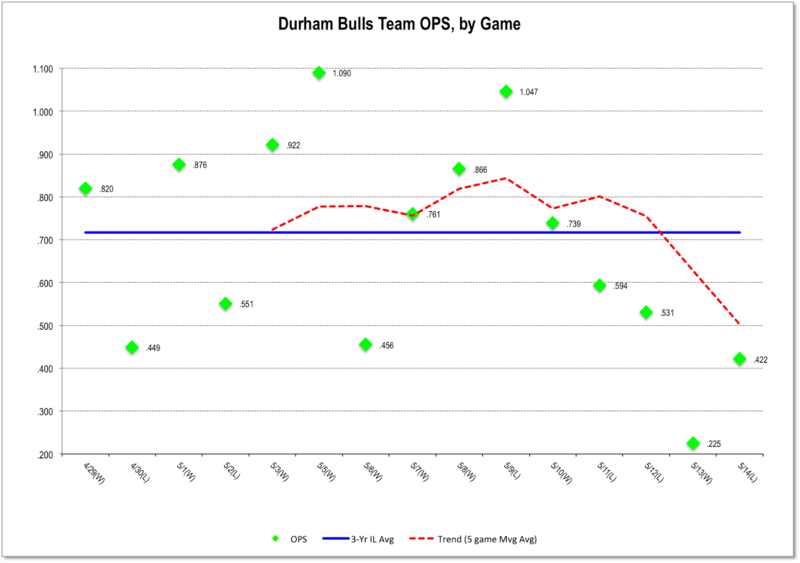 The Bulls have gone from 9th to 6th place in batting average ranking, from 5th to 3rd in OPS rankings, and from 4th to 3rd in ERA. 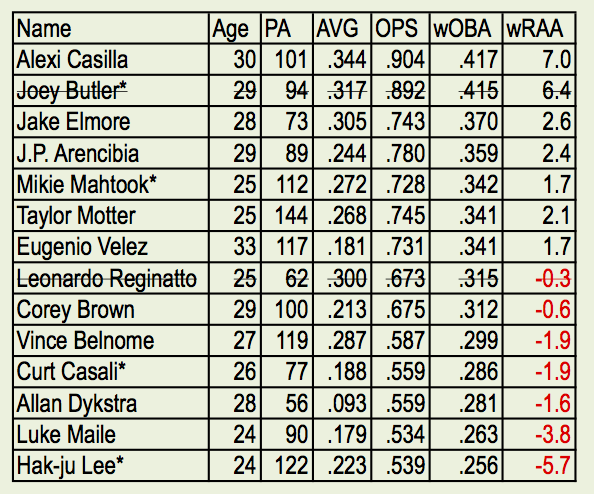 Meanwhile, the Bisons went from 5th to 10th in batting average, 7th to 13th on OPS, and from 1st to 2nd on ERA. But we still need to remember that this is early in the season and rosters are in turmoil. Very hard to detect meaningful trends. But the Bisons have been on a tough run, losing their last six games. *Possibly the best book available on minor league baseball. On the shelf at Quail Ridge Books and on half-price sale down in the ballpark store. Last night I was off having fun playing guitar in a group of friends, but my iPhone First Pitch app kept up with these annoying notifications telling me that the Bulls were losing, badly. The last time I looked the score was something like 6-1, so I stopped looking. Then I got to my car, turned the radio on and discovered the Bulls were back in the chase after scoring a run in the 6th and three more in the 7th. I was home and had the computer fired up by the top of the 9th. There I saw Hak-Ju Lee single and steal a base, Taylor Motter get a walk, Alexi Casilla sacrifice them over to 2nd and 3rd, Eugenio Velez bring Lee home on a sac fly, and Corey Brown double in the go ahead run. Then Andy Oliver got his first save opportunity and squeezed the thrills out it. After the first batter popped up, a single and a walk put men on 1B and 2B. Then Lee, playing shortstop, tried for a force out at 3B on a ground ball. Didn’t work. Bases loaded. One out. The heart-stopper was a line drive to third baseman Leonardo Reginatto. He grabbed the line drive, then tagged the base for an unassisted double play. Game over. And so the Bulls have their fifth win in a row and added to their lead in the IL South. The relief corps has now gone eight games without letting a run across. That means that Matt Buschmann was charged with all 6 of last night’s runs, which didn’t do his ERA any good. And the 3 home runs by Syracuse ruined his FIP. After a grand total of 2 innings pitched in one game, Matt Andriese is headed for St. Petersburg, probably for a start opportunity. Andrew Bellatti, who has had 5 appearances and doing very well, was added to the 40-man and called up. Congrats! Jake Elmore, last seen in a Bulls uniform on April 21, is on his way back. His playing time with the Rays was limited. Only 14 plate appearances in 7 games. But solid numbers: .308/.357/.973. Not sure why he’s coming back unless Nick Franklin has finished his rehab. 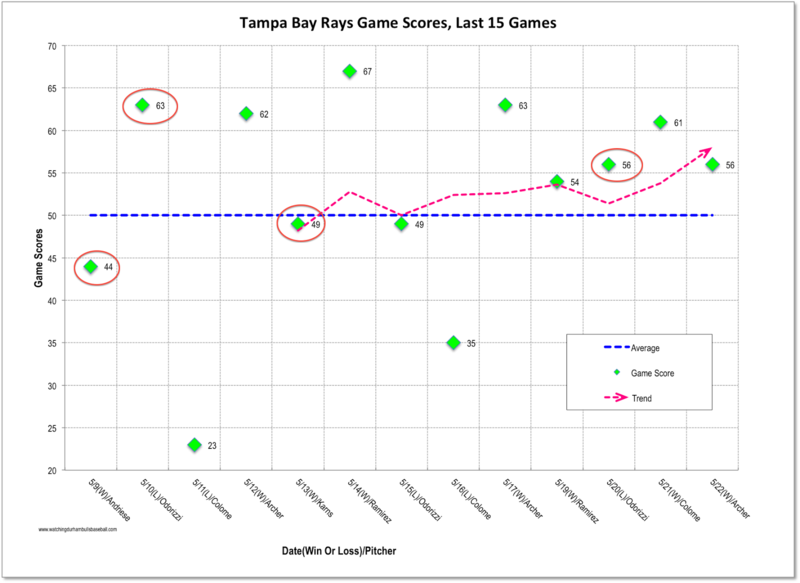 We don’t have a lot of Rays fans around here, but it’s fun to keep an eye on them and run at least a couple of the same charts we do for the Bulls. 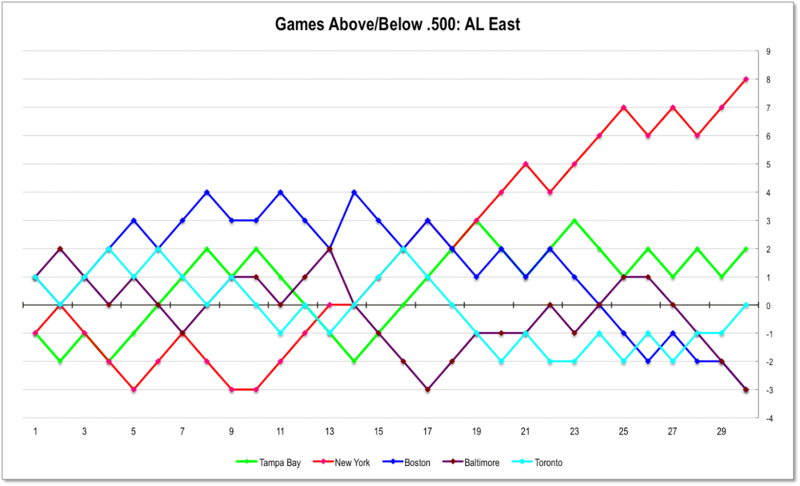 Here’s the games above/below .500 chart for the American League East. The Rays are doing pretty well and are staying in touch with the Yankees in spite of all the pitching injuries, flu, etc. 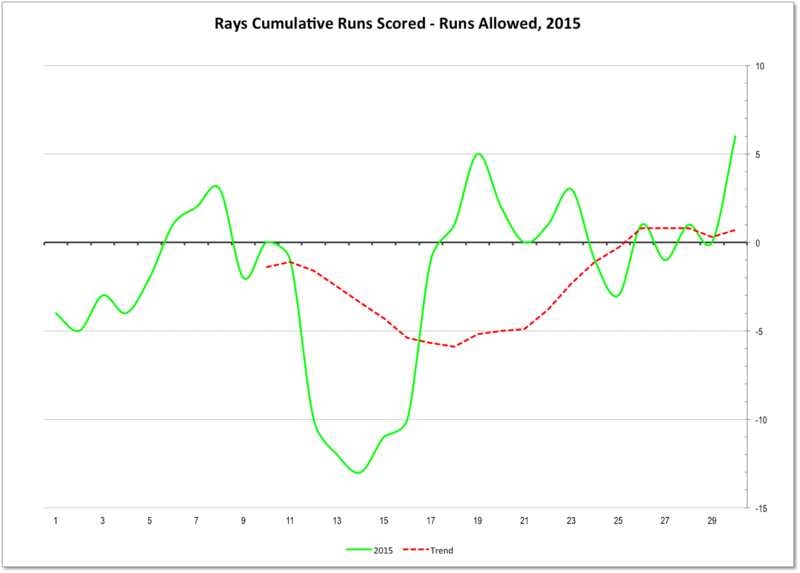 Their runs scored minus runs allowed chart is less encouraging. The Syracuse Chiefs are the Triple-A affiliate of the Washington Nationals. Not having a great year. But the year is young. Unless there's more roster shuffling, the numbers favor the Bulls. Another noisy Education Day and some good baseball to be watched. 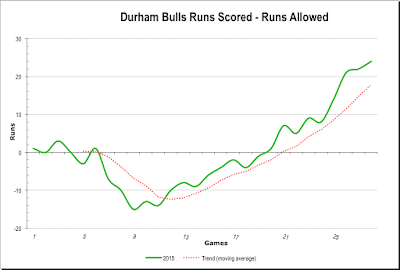 At first it seemed that the Bulls were going to run away with the game, especially after scoring two runs in the 1st inning and loading the bases with none out in the 2nd. However, the Bison’s Todd Redmond, who we have seen a lot over the years in various uniforms, struck out the side. Then the Bisons tied it up in the 3rd. Eventually, however, Redmond faltered and Belnome’s RBI of Lee in the 4th followed by Motter’s sac fly that brought Casilla home in the 6th were the difference. All praise to the Bulls bullpen. They have not allowed a run in the last seven games. We have to mention the deep confidence that Sandberg must have in Allan Dykstra. Dystra started at DH! Here’s a guy batting .000 since joining the Bulls. And he started out with a pop-up to 3B, a fly out to centerfield, and a ground out to 1B. In the end, however, he got his first hit of the year, a double to left field in the 8th inning. We should probably be a bit worried about both Mikie Mahtook and Taylor Motter, who collided in the outfield in the 3rd inning (Mahtook hung on to the ball, though). Both seemed banged up. Rob McLamb of the Herald-Sun has a bit more information, but not much more. OK, let me rant about parking for day games. If you buy a season parking package, it turns out it doesn’t count for day games. One option is the parking garage over by the new county admin building. It has one of those automated deals where you put your ticket in and then your credit card. The machine spits back your ticket and your credit card gets charged for the parking. In this case $5. So far, so good. Here’s the fun part. It took me 30 minutes to get out of the garage and when I put my ticket in to get out of the gate, the machine wanted another $2.00 before it would let me go! Now there I was with a host of not happy folks behind me that were certainly not going to be understanding. So I put my credit card in and I was free. But I don’t think I’ll ever use that parking deck again, and I certainly can’t recommend it as a day game solution. Elsewhere, an interesting article in The Economist magazine on the statcast system being used to generate data for major league baseball. The Bulls are up in Syracuse for three games against the Chiefs. 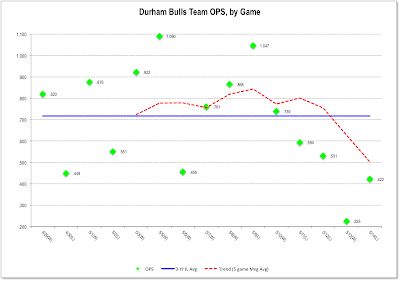 This chart tracks the game by game runs scored minus the runs allowed by the Durham Bulls. What does it mean? Other than the profound observation that it takes scoring more runs than your opponent to win a game? Not too much. However, it turns out that if you crank the data through a formula called the “Pythagorean Expectation” you can come up with numbers that very often matches the team’s won-loss record, which I find both very interesting and a bit creepy. 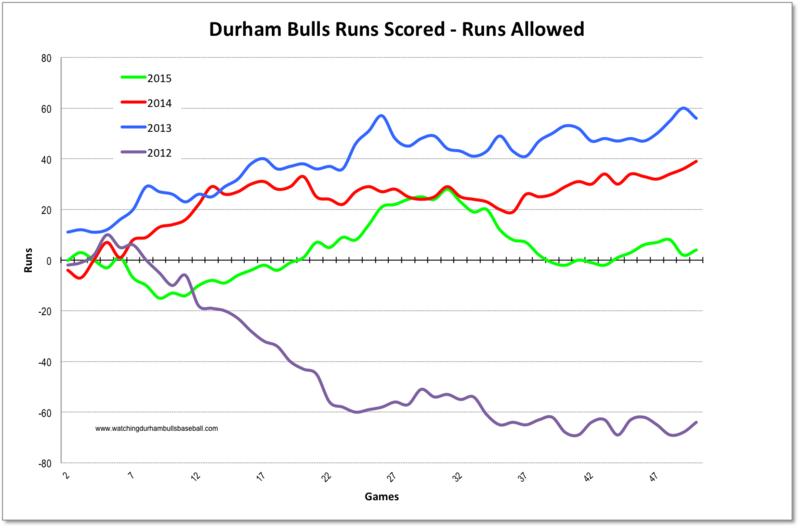 If you crank the Bulls current runs scored and runs allowed through the equation you come up with a “PE” of 17-11, an exact match of their current won-loss record. How cool is that? Today is the first day off for the Durham Bulls this year. We are reminded of just how relentless the pace is for those who play this game. For the last 25 days the guys have suited up and (with weather exceptions) gone out on the field every single day. It’s a tough job. Tomorrow the Buffalo Bisons, the Triple A team of the Toronto Blue Jays, are in town for their only visit of the year. The Bulls will play them here for three games and then they’ll play three games next week (May 11-13) up in Buffalo. And that’s it. They will not see each other again this year unless they meet in the playoffs in September. 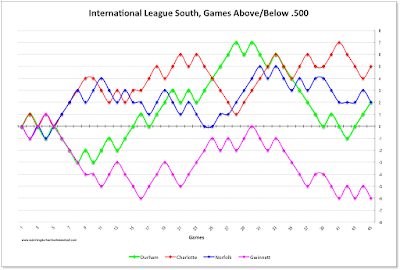 Just now the Bisons hold the best record of any team in the International League, and they have the best pitching in the league. That means that we should be seeing some interesting baseball, including another early morning “education day” next Thursday.